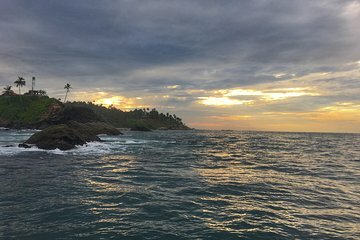 This 3-night private tour along Sri Lanka’s south coast provides the perfect introduction to its beachside cities. Departing from Colombo, you’ll travel in the comfort of your own private vehicle to Hikkaduwa, including a visit to its moonstone mine. Observe hatchlings at the Kosgoda Sea Turtle Conservation Project, tour UNESCO-listed Galle Fort, search the coast for whales at Mirissa, and enjoy a wildlife safari in Yala National Park, the second largest wildlife park in Sri Lanka. Includes overnight accommodation with breakfast and dinner plus round-trip airport transfers. We found that the tour was poorly organised with no detailed information about the activities scheduled. It was assumed that we would do the activities however, when we asked for details regarding prices which were not included and then elected to not do them, there was no alternative and therefore, we were left at the accomodation. A stop at the blowhole was in our schedule however the driver did not know about it so there was confusion as to what we were meant to do. Also the tour says dinner included, so when the accomodation asked us to pay for dinner as we were checking-out, we had to tell the driver to sort it out with the tour manager this happened recurrently. On the last day we elected to not do the activity and asked the driver to stop at a small town instead on the way back to the airport. The driver tried to accomodate our request and was fantastic however, it was clear that he was under stern instruction from the tour manager which instructed him to go straight to the airport and not accomodate our request. We then spent an extra 5 hours waiting at the airport which was a waste of time. Overall the tour was poorly managed at no fault of the driver whom was fantastic. Also the tour manager would inappropriately message me continuously after the tour had concluded to review the tour, which I found rude.